Known for its picturesque historic city center, Cuenca has become a destination for foreign retirees and is a lovely place to stop through while traveling around Ecuador. 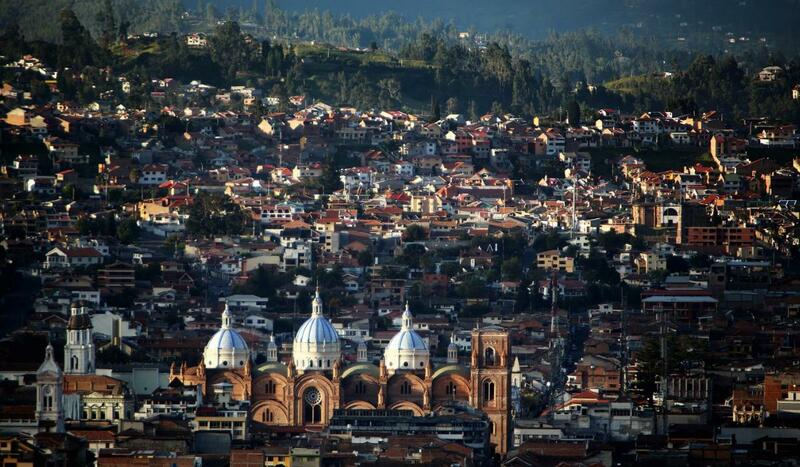 Like Quito, Cuenca is a high-altitude metropolis and sits at 2,550 m (8,370 ft) along the Ecuadorian Andes. In the following blog, we’ll give you tips on how to get from Quito to Cuenca and what you can do while visiting Cuenca. Public transportation: If you’re traveling by bus, you’ll need to leave from Quitumbe (“Terminal terrestre Quitumbe”) to get from Quito to Cuenca. If you’re staying in Quito’s historic center or Mariscal district, Quitumbe is a $10-20 taxi ride (depending on the time of day) or a $0.25 trip on the Trole. However, try to avoid taking the Trole by night and always keep an eye on your possessions when you’re using public transport in and around Quito. In Quitumbe, you’ll find a number of bus companies that depart to Cuenca. The trip from Quito to Cuenca takes about 10 hours, so select a bus company that appears to have comfortable seats, although few seats will feel comfortable for an entire 10 hour journey! A few bus companies that travel from Quito to Cuenca are: Panamericana, Flota Imbabura, Loja International (passes through Cuenca, ends in Loja) and Cooperativa Turismo Oriental. 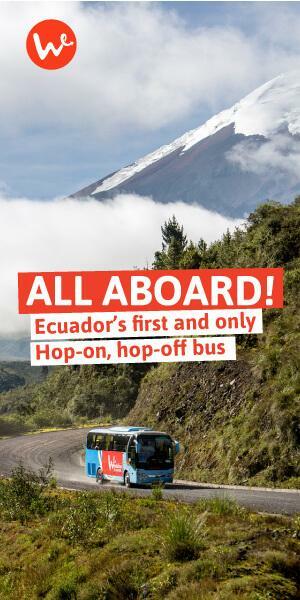 The cost from Quito to Cuenca will vary, but expect to pay around $10 per person, and to find updated departure times, have your hostal call a bus company directly, check their websites or get to the terminal early (expect to wait quite a bit!). Do you want to skip the hassle (and safety issues) of public bus terminals? Consider hopping on the Wanderbus! 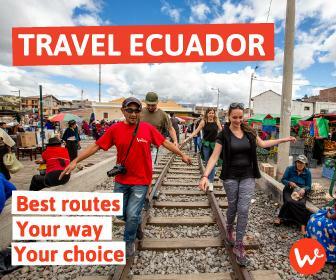 Wanderbus Ecuador: For a trip as long as the Quito to Cuenca route, an excellent alternative to public transportation is the Wanderbus. A number of our Wanderbus passes take you from Quito to Cuenca, stopping at a few must-see destinations like Cotopaxi, Quilotoa, Baños and Riobamba. If your travel plans aren’t set in stone, you should seriously consider this option. This way, the 10-hour journey to Cuenca will be broken up into more manageable chunks, giving you the chance to see the best of the Ecuadorian Andes and completely skip the inconvenience and discomfort of traveling on regular buses. Our Wanderbuses have established hop on-hop off locations that are close to Quito’s city-center so that you can avoid the Quitumbe bus terminal completely. Our vehicles are also modern, comfortable, and regularly maintained. The best part is that you can adjust your itinerary along the way and get the insights of our excellent guides as you travel around. Say you fall in love with Quilotoa (highly likely) and want to hike the Quilotoa Loop, which would take an additional 3-4 days. With the Wanderbus, you can simply hop off, hike the loop, and when you’re ready to continue south, hop on the Wanderbus when it swings by Quilotoa again. If you prefer to skip the bus altogether, there are relatively cheap domestic flights that will take you from Quito to Cuenca. You can buy your tickets through LATAM Airlines and tickets will range between $50 – $150, depending on the season. Once you arrive at Cuenca’s airport, Mariscal Lamar, take a taxi into the city. From Guayaquil, Cuenca is only around 4-5 hours away. Buses depart regularly from the bus terminal in Guayaquil and tickets cost around $8, though some may charge $10-11. A couple of bus companies that run this route include Cooperativa Alianza and Cooperativa Super Semeria. Due to its location and history, there are plenty of things to do in Cuenca. Numerous museums and buildings around Cuenca’s historic center preserve elements of the city’s rich history, made accessible to all visitors. As a city along the Andes mountain range, it also offers access to the impressive vistas and natural environments in its surroundings. And, finally, as an increasingly popular destination among foreign nationals, the demand for live music and quaint cafes has also increased, making it a comfortable, and fun, destination for travellers of all demographics. If you took the 10-hour bus ride down from Quito, the museums can wait; you deserve some R&R. Cuenca’s Parque Calderón, as well as other plazas speckling the city, are the perfect spots to sit and people watch. The “Ruta de los Museos”, or Museum Route, is an activity promoted by Cuenca’s Municipal Department of Culture and is a wonderful way to delve into local culture and history. While you can undertake the route yourself, most of the museums offer guided tours as well. The best part? It’s practically free! Most of the museums along the route have free admission, though a handful charge a minimal fee, from $0.50-$4.00 per person. Use this guide, which includes a map, to see the Straw Hat Museum, the Museum of the History Society of Medicine and the highly acclaimed Pumapungo Museum, as well as another 11 museums. The San Francisco Market is a hub of activity and sells everything from plasticware to Otavaleño alpaca sweaters. Local Ecuadorians shop here for their basic supplies, giving the market an authentic feel, compared to other markets that are mainly geared to attract tourists. While you’re there, grab a bite to eat at one of the food stalls and stop by the souvenir stalls along the north side. Another fun market to visit is the Mercado 10 de Agosto, full of fruit and vegetables. You can even experience an Andean “limpia” cleansing ceremony there. A double decker bus tour leaves from Parque Calderon on an hourly basis throughout the week and will help give you a sense of the city, and also provides interesting facts about Cuenca’s history and culture (English and Spanish). The bus operates from 10:00 am – 7:00 pm on weekdays and Saturdays and on Sunday operates from 10:00 am – 5:00 pm. The tour lasts around 2 hours, so make sure to bring some snacks, and tickets cost $8 per person for either the north or south route. If you choose to do both, that costs you $12. A relaxing activity to do in any city, and a great way to befriend fellow music lovers, is to visit a few local venues that offer live music. If you like classical music, performances at the Cuenca Symphony Orchestra are free to the public. The Cuenca Jazz Society Cafe and Santa Canela Hostal Bar & Grill regularly offer live jazz and blues in a cozy environment, and the Broken Bridge Tavern is also known to bring musicians in for entertainment. A lovely morning activity is to stroll along Rio Tomebamba, one of the rivers that divides Cuenca’s historic center from the more modern southern side of the city. A (mostly) paved path runs along the river and if you prefer to cycle, you can rent a bike at TerraDiversa. If you don’t have much time, you’ll find the nicest section of the walk along Calle Larga toward the University of Cuenca. Though not part of the aforementioned Museum Tour, the CIDAP museum is well worth a visit due to its location and its curated exhibits. The museum is dedicated to spotlightling the work of artisans and popular crafts in South America, such as textiles, woodwork, ceramics and more. Admission to CIDAP is free and the museum is open everyday except for Sunday from 10:00 am to 5:00 pm. 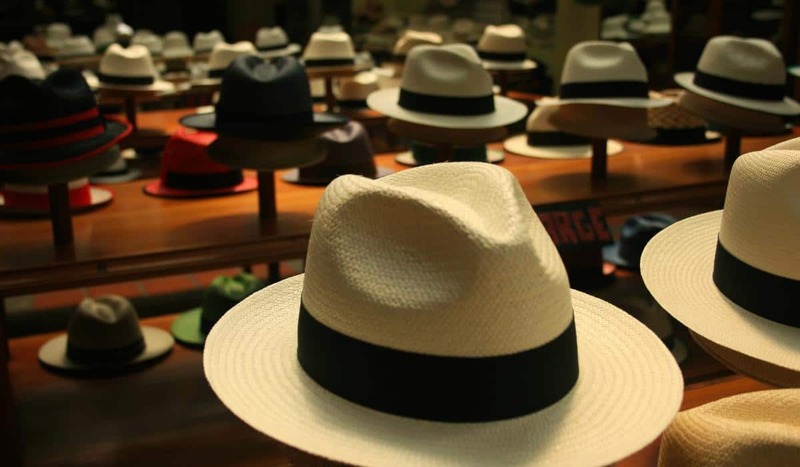 While you’re there, check out their store, where you can purchase many locally-produced products, including some beautifully woven hats. If you love hiking and nature, you can’t skip a visit to Cajas National Park. In fact, one of the main reasons people come to Cuenca is to visit this otherworldly place. Only 30 km away from Cuenca, Cajas National Park covers a vast 285.44 km2 (28,544 ha) and ranges between 3100m and 4450m in elevation. The high grassland ecosystem here, also known as the paramo, combined with the mountain fog and placid lagoons makes Cajas an incredible place to explore. As you hike through the park, keep your eyes open for the South American condor, one of only eighty left in the country. 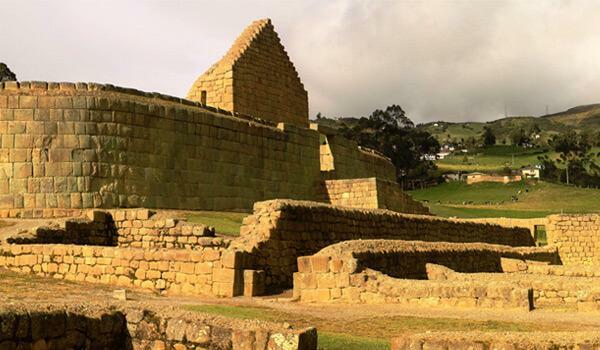 The Ingapirca Ruins are the largest known Inca ruins in Ecuador and you can visit them from Cuenca on an easy day trip. The name Ingapirca means “wall of the inca” and this site is believed to have been of religious importance where sacred rituals once took place. The ruins are open everyday from 9:00 am to 5:30 pm and admission costs $2.00. You can get to the ruins by bus from Cuenca’s bus terminal or you can go with a tour operator. Once there, take a guided tour to understand the backstory and symbology of the various structures. Santa Canela Hostel & Restaurant – Located near the Termas del Daymán, this is a quiet and comfortable spot with a garden, swimming pool and daily breakfasts. Casa Montalvo Bed & Breakfast – Casa Montalvo is built in a beautiful old house that gives guests a sense of Cuencan culture and history through its architecture and decor. Its highlights include the daily breakfast menu and the rooftop terrace where guests can hangout. Hotel Boutique Los Balcones – Staying here might be a splurge, but is well worth it! The hotel offers guests high quality accommodation, comfortable beds, and is well located in the city. Cuenca rooms B&B – This is a small but cozy option and is located only a few blocks from the historic center, giving you easy access to many of the attractions, cafes and activities Cuenca has to offer. Los Tiestos: One of the top rated restaurants in Cuenca. Clients rave about the shrimp soup and there are also vegan and vegetarian options available. Make sure to reserve in advance. El Mercado: A friendly (and fully bilingual) spot with a fresh, local menu and a great selection of wine. While it’s best known for its seafood, it offers a wide variety of dishes. Hotel Santa Lucía: A high-value, elegant restaurant (and hotel) built from a restored house. It also offers vegetarian and vegan options. Pizzería Marea: Pizzeria Marea uses an adobe, wood-fired oven to make its pizzas in Cuenca and in Montañita. Other food options are available, such as pasta, and in Cuenca you can also get breakfast here. San Sebas: Another cozy spot with great breakfasts, lunch and coffee in Cuenca. They also organize fun events like “Vino & Van Gogh”. There’s really no wrong time to visit this lovely city. The climate here is similar to that of Quito 15-22 C (60-70 F) and is often describes a perennial spring. However, during rainy season and because of its elevation, Cuenca gets quite cold. Since buildings here aren’t made to withstand cold weather, it can feel quite chilly indoors as well. With that in mind, try to visit Cuenca during its dry season, which is between June and December. Regardless, always bring a light sweater and rain protection with you since the weather in the Andes can shift quite suddenly. Plan your trip to Cuenca with Wanderbus – you won’t regret it! Check out our passes here.